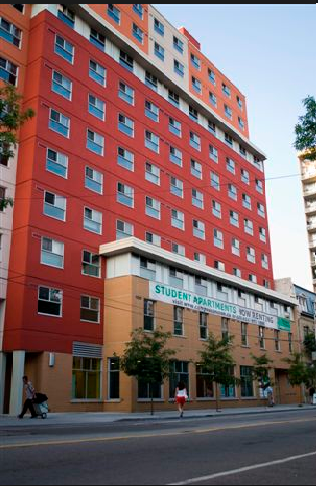 DMS is a leader in the management and operations of student residences with experience in managing nearly 3,000 beds across Ontario. This portfolio includes a diverse mix of privately owned and institutionally owned facilities. Marketing rooms to students requires specialized tools and knowledge of local market conditions. We have developed web based software for posting our properties, use student body organizations as rental agents and we partner with the local colleges and universities to maximize our exposure. Unlike traditional high rise residential properties, leasing student housing happens in a compressed time frame that coincides with students making plans for the next academic period. In order to maximize occupancy a rigorous approach is required to lease up well in advance of projected occupancy and capture the market while the students are on campus. Typically our leases start either May 1st or September 1st and have terms of 12 months. Having all residents for a building move in on the same day presents operational challenges. We have developed a move-in protocol to streamline this en-mass transition of new tenants into each property. The same challenge presents itself at move-out, as the student housing market typically has over 50% tenant turnover year over year. The move-out process we have developed includes a room by room inspection prior to taking vacant possession of each unit to ensure the property assets are protected and a site based move out team to coordinate an orderly exit. For our larger properties we employ "student-life" assistants that are assigned to every two large floors, and one for the remainder of small floors, to be responsible for all aspects of tenancy supervision. The student-life assistants also work with the building population to develop resident programs including local community development and integration into the various educational institutions.